Landscape Kurbing LLC - Reasons to choose continuous concrete curbing! If one of these pictures resembles your landscape, give us a call or shoot us an email and we would be glad to come out to give you a free estimate. Reasons to choose continuous concrete curbing! If one of these pictures resembles your landscape, give us a call or shoot us an email and we would be glad to come out to give you a free estimate. 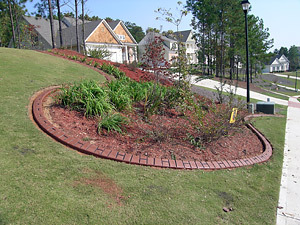 Brick or Rock move when individually set where curbing is continuous and you can edge right up to it. Metal borders start to fade and rust over time! As you see even these brick sections fall over continually. They are difficult to keep in straight line also. Crossties rot and also discolor. We can take a blank canvas and by putting in curbing change your Landscape dramatically. 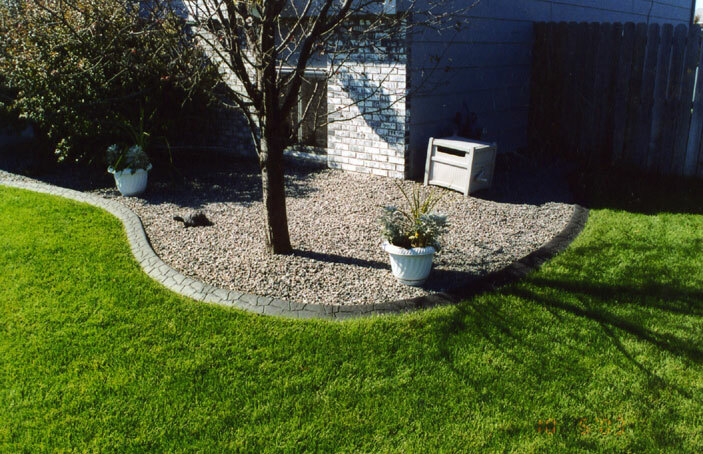 * A continuous concrete root barrier keeps lawns in check. * Concrete is durable. It won't rot, shatter, splinter, etc. * Maintenance is simple. Lawn mower wheels fit easily on the leading edge. Clean up with an edger or trimmer without damaging the edging. * Beautifies your yard placing a picture-perfect frame around your flowerbeds. * Design flexibility allows for straight lines, curves, turns and contours. * Fast, clean and efficient installation without the problems associated with costly form work. * Save hours of edging, trimming and weeding time. * Less expensive. Higher quality. * Curbing will highlight and define your yard, planters, and property line. * It's a continuous, extruded strip of permanent concrete laid by a curbing machine. * It never needs replacing, like other types of edging. * It retains wash; it keeps mulch, rock, and soil where it belongs. * It's weatherproof; it won't rust, rot, or deteriorate like metal, wood, or plastic edging. * There are a variety of custom colors, shapes, and stamps to accent your Home. * It saves time mowing, edging, and weeding.